For more than four years, we had a vague hope that it would happen on our own terms. The terms were that we'd be living in the United States once more. But, realistically, we knew we didn't have absolute control over it. IT was that one of us got sick enough to need a hospital. I had the honor, if you can call it that. I basically had to go to the hospital because I waited too long to see a doctor about a persistent cough. It started March 7th with a sore throat. Then I coughed for five days. And coughed for five days more, with increasing harshness. If I had gone to a doctor after that first five days, I probably wouldn’t have ended up in the hospital. 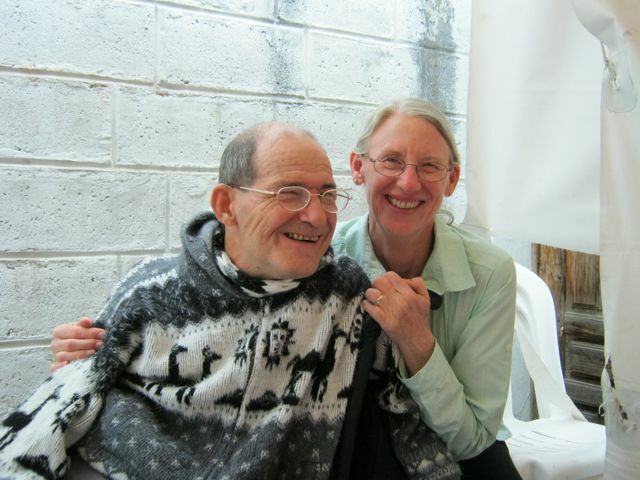 (The doctor I went to in Otavalo, with good reason, got on my case for not going to see her sooner.) She gave me some strong antibiotics on Monday, March 17th. When I went back to see her Wednesday, March 19th, I was a little better, but she said I should have been much better with the antibiotics she had given me. She told me to go see a pulmonologist or internist in Ibarra that night, about 30 minutes away, IMMEDIATELY. Unfortunately, she had no one to recommend, aside from mentioning specialists at a clinica particular (private hospital). So, as we were driving to Ibarra, we were concerned about where we should go. Fortunately, Isabel and Luz, Isabel's sister-in-law, came with us. Luz's sister is a nurse in Ibarra. Luz called Lorena for a recommendation. Recommendations from family members are how a lot of things get done in Ecuador. Lorena recommended an internist whom she said was top-notch at the Clinica Ibarra. That's where we went. It was easy to find because it was near the dealership we take Billy Bob (our van) to when he's sick. Admittedly, we were relieved not to have to go to a public hospital. In a way, I'm ashamed to say that. We're down here because we came to work with poor people. It feels like we should be sharing their lives. But Marilyn and I have both visited public hospitals and have been uneasy about the level and quality of care provided. That's why we've informally agreed that we'd go back to the United States when our health begins to deteriorate. Dr. Rodriguez listened to my lungs for about two minutes before admitting me to the hospital. He turned out to be very confidence inspiring, even speaking pretty good English. He said I had a bad case of bronchitis, with a little pneumonia (which our doctor in Otavalo had feared). They had me X-rayed, into a bed in a private room, and hooked up to IV's within an hour of my arrival. For the three nights I was there, the hospital staff was very attentive, I had antibiotics and expectorants via IV, I had nebulizer treatments, and I had pulmonary therapy. The hospital itself was immaculately clean. The room was mopped once a day and the trash was emptied twice a day as the bathroom was being cleaned. Something good came out of my being sick enough to need a hospital. 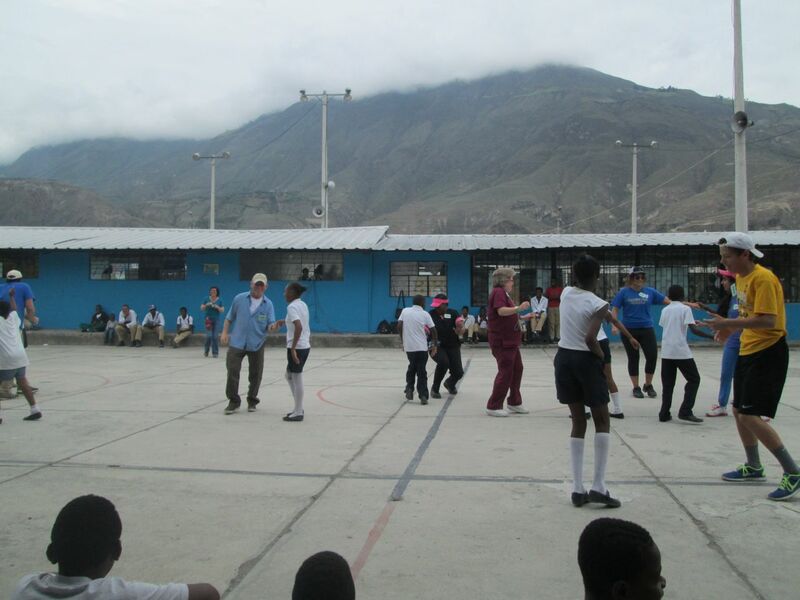 I’m no longer as afraid of contracting a serious illness in Ecuador as I used to be. We now know where to go to get the help we need. And it's only 30 minutes away. Of course, I still coughed up phlegm for a few days after being released. But I feel a lot better now, both physically and mentally, knowing I can get good care without having to resort to flying back to the United States. The real confirmation of the care I received here will be to receive a clean bill of health when I see my regular doctor (who is great) for my annual physical in about a month. I'm confident that I will. By the way, that physical exam and associated tests, after Medicare and our supplemental insurance, will probably cost us more than my three-night hospital stay. It was muy carro (very expensive) for most people we know here. But it was almost ridiculously inexpensive compared to what we're used to spending in the United States. Sorry that I am so slow in reading this and hearing about you being so ill. Hope you are much better by now. I'll try to remember and send you a treat, of Tillamook cheese, with Blanca an Luis when they visit in a few weeks. Thanks. I'm back to normal now. Like I said, it was good to find out where to go for good care. We'll look forward to that Tillamook cheese, although we'll be in the states during the same time as Blanca and Luis and also plan to bring cheese back. 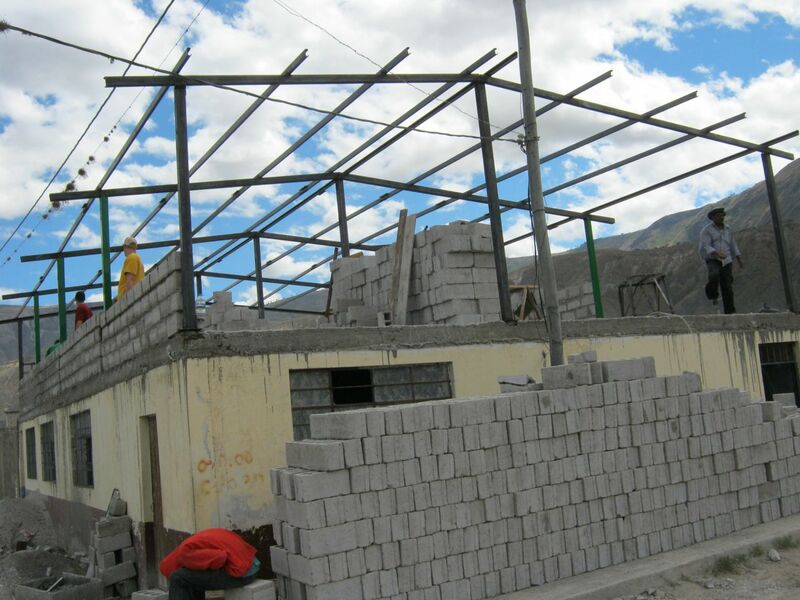 From March 6th to March 16th, FEDICE worked with two mission groups in the town of Pusir Grande of the Chota Valley. 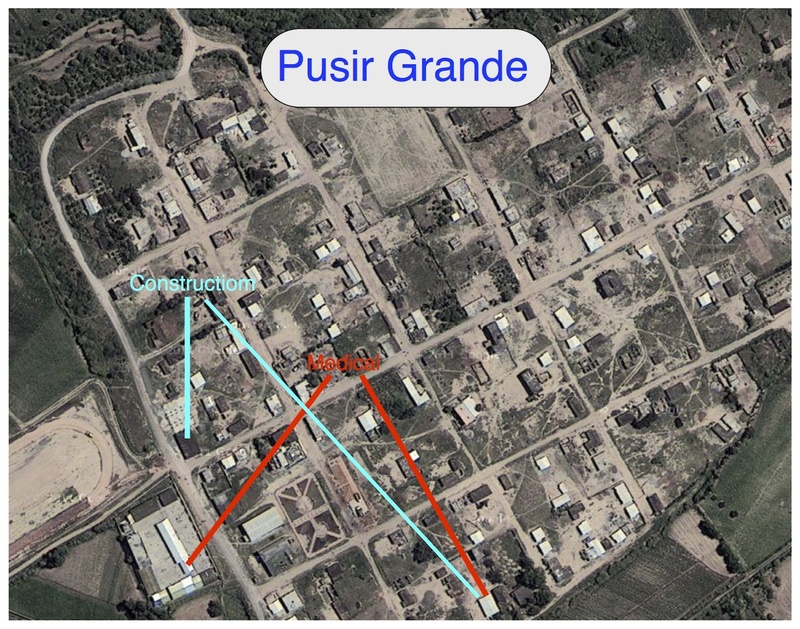 Pusir Grande is about an hour and 45 minutes north of Otavalo, where we live. 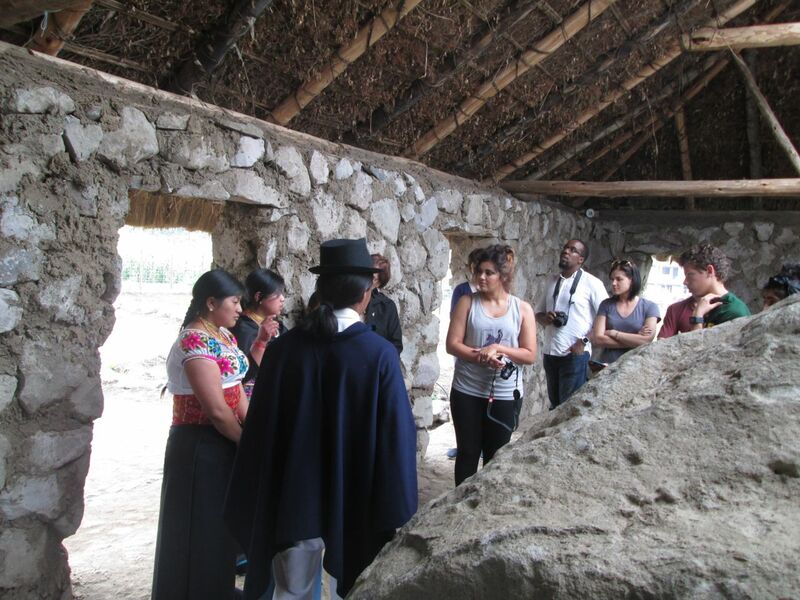 Our jobs were to help with setup, orientation, and touristic guiding once the groups had completed their work. Actually, both groups were under the auspices of Bridging Cultures, a non-profit U.S. organization that FEDICE has partnered with. 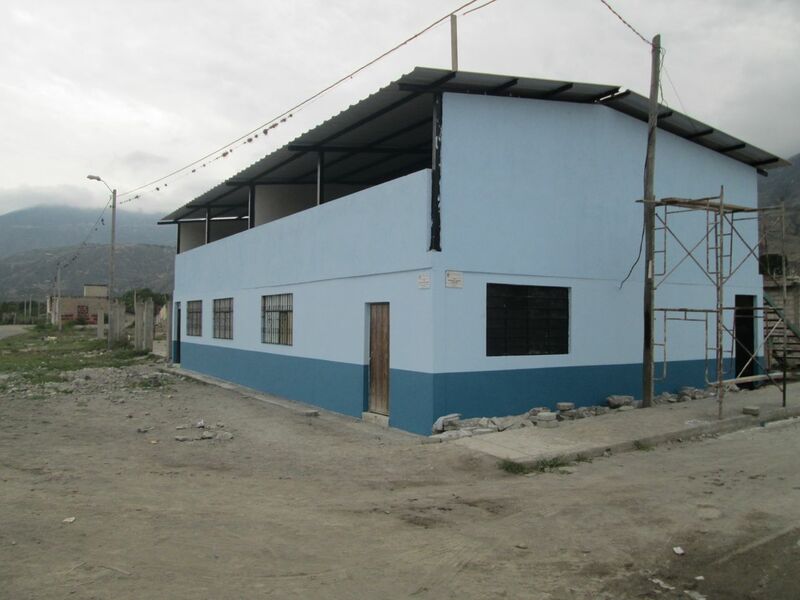 Since Bridging Cultures does not have staff in Ecuador, FEDICE performs the tasks of community organization, training, and logistics for Bridging Cultures in exchange for remuneration for its staff. Both organizations have benefited from this relationship and have been able to help more people than would be possible singly. The first group to arrive, which we'll call Larry's Group after their leader, came with sleeves rolled up and ready to pound nails, paint, whatever. They also brought a medical team consisting of four of five people. We (meaning FEDICE) had not been informed of the medical group in advance. Oops. However, Blanca Puma, our Executive Director was able to work her magic and get them set up properly so they could use their expertise to serve the community throughout the week. As far as I know (I wasn't there the entire time), things went smoothly for the medical team. The construction team worked wonders. The recent focus of Bridging Cultures' efforts has been to add a second floor to an existing building so it could have a dual purpose. Shop will be taught on the first floor. Computer Science will be taught on the second floor. Larry's Group all but finished the building, putting a roof on, painting the outside, and painting the inside. The only thing left to do is to put in the windows. 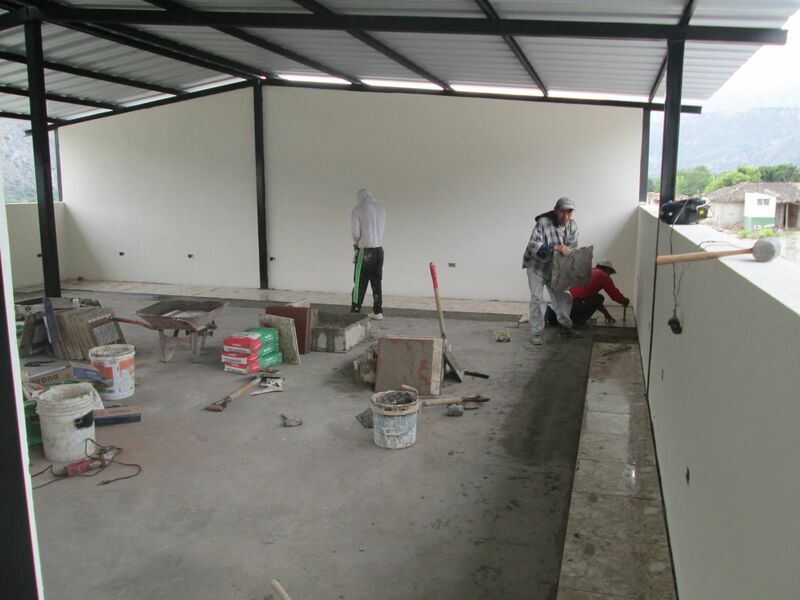 They also painted the small medical center in the village. Larry's Group was mostly composed of members from First Christian Church in Tyler, TX and consisted of both younger adults and older (but definitely not "over the hill") adults. They were veteran "mission trippers". They have gone on mission trips in each of the past nine or ten years. A few destinations I heard mentioned were Nicaragua, Honduras, Guatemala, and Costa Rica. This was their first trip to Ecuador. The second group arrived two days after Larry's Group. We'll call it Sammie's Group, after their leader. They also worked in Pusir Grande, but had a much different focus. Most of the group of eight consisted of students and teachers from North Central Texas Academy at Happy Hill Farm near Granbury, TX, and they were interested in cultural exchange. They also brought a videographer to record interviews between their students and the students of Pusir. They will use these video recordings to help raise awareness of the work in Pusir. 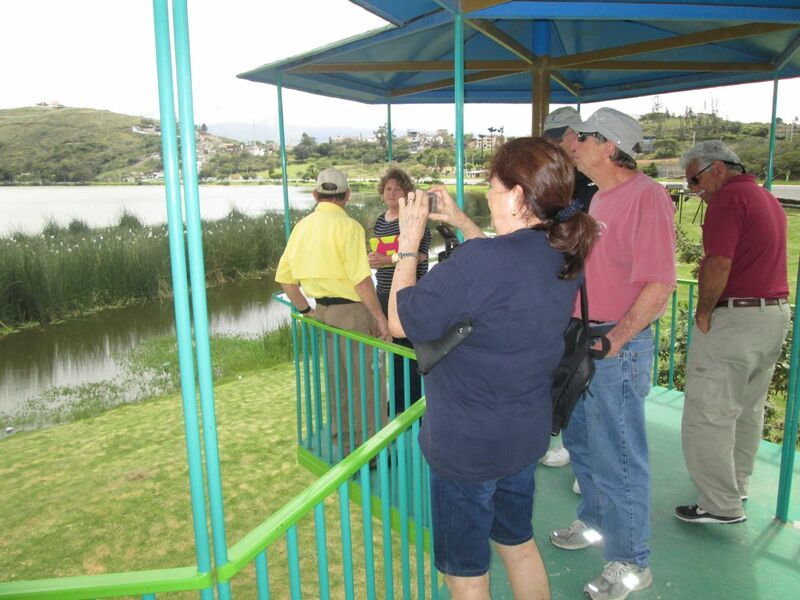 The next day Marilyn guided Sammie's Group to some touristic sites in and around Otavalo. 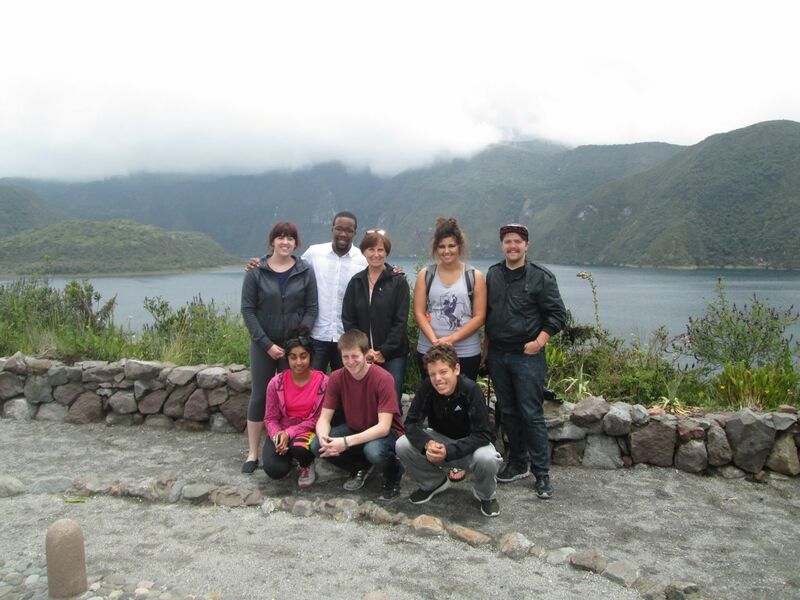 FEDICE is good about making sure that groups can indulge in some tourism after their work is done and before they head back to the U.S. After all, many who come down on mission trips will never have the chance to return to this beautiful country. It's only fitting that they be able to experience more than the work of alleviating poverty. I didn't accompany Marilyn for fear of passing on whatever I had. Marilyn did the same for Larry's Group on Friday and Saturday. On Saturday they changed the schedule we had planned for them so they could spend all morning shopping at Otavalo's world-famous Plaza de Ponchos. Funny. I hadn't expected that from this no-nonsense group. They bought bags and bags of stuff. I wonder if they had to buy extra suitcases. I think both groups had good experiences on the whole, although it's possible that Larry's construction crew may have pined for a few more nails to pound. Blanca, Hugo, and Luis may have had a few hectic days organizing things, but probably nothing that they are not used to. We didn't help the entire time because the groups had to conserve their monies and thus couldn't pay our hotel and food bills. I probably would have been more of a burden than help anyway because I wasn't feeling all that well. As we often do with groups, we became pretty good friends with a couple of people. And, as always, we invited them to our house for a vacation. We'll see if they can actually make it some year. Yes, you know who you are! Oh, and those we didn't have a chance to invite? You're invited, too!